This galaxy has received considerable notoriety recently due to the discovery of tidal tails, loops of debris, that are markers of an earlier collision or collisions of galaxies. 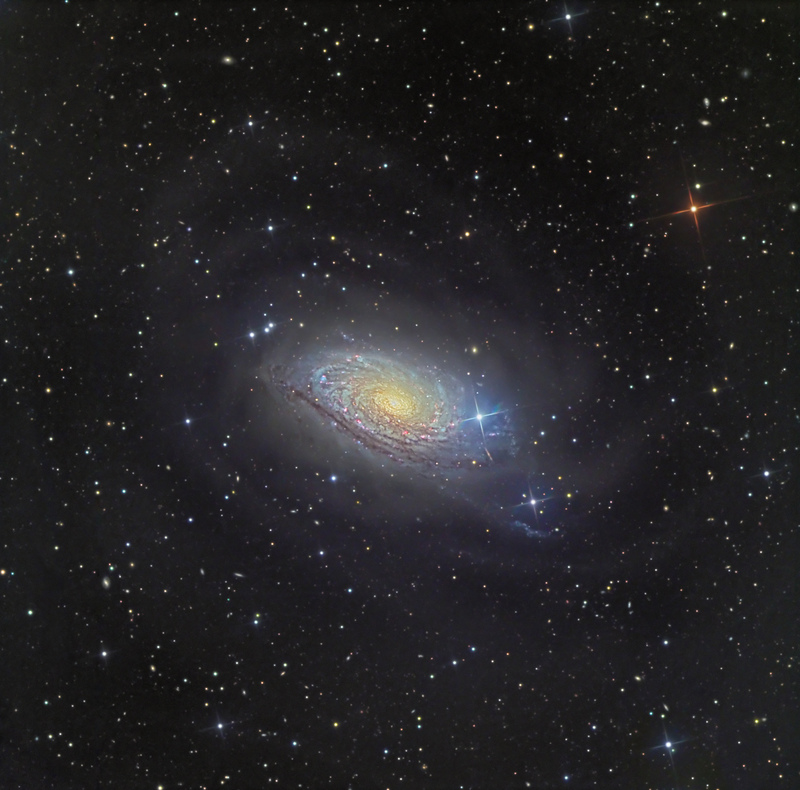 The discovery was made by a collaboration of professionals and amateur astrophotographer, R. Jay Gabany. Click here to see their seminal image. Amateur astrophotographer Tony Hallas also has a deep image showing these tidal tail loops. Thus, the goal here is to determine if these loops can be brought out, since they required dark skies, many hours of exposure and delicate processing methods for signals that are close to background levels. The tidal tails are faint and may require a bright monitor. There is additional galactic dust in the image, as well, along with a multitude of tiny galaxies in the background in this deep image. The “Sunflower” name comes from the yellow, mottled appearance of the core. There are many pinkish HII star-forming regions. M63 is part of the M51 Group, that includes the Whirlpool Galaxy, M51.